Today, Xur is back in Destiny, a video game that wouldn’t be nearly as good as it is now if we hadn’t spent the past year traveling through space and complaining about Destiny. The infamous weekly shopkeeper is a little bit different now. Instead of a guaranteed weapon every week, Xur will now either sell one specific weapon or an exotic engram. (This week, he’s got helmet engrams.) He’ll also sell Legacy Engrams, which are random pieces of year-one gear that will skew towards stuff you don’t have already. The point is to fill out your year-one collection. 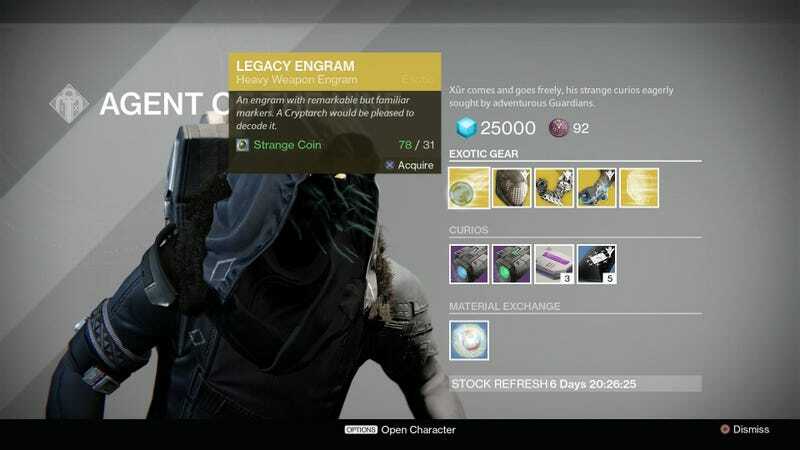 Hope you saw “Legacy” before you spent 31 coins on that heavy weapon engram, because it’s only got 170 attack! He’ll also keep selling class armor for strange coins—which are a little harder to get these days, since they’re no longer guaranteed from the weekly heroic—and he’s got a new item called the Three of Coins that’ll make strikes way more rewarding. PSA: Today, Xur’s by the Speaker. And he’s selling some rad warlock gloves that you’ll definitely want to buy if you’re playing Stormcaller. Also, if you’re playing Destiny: The Taken King, do not miss our massive tips post! It’s the best way to prepare for the raid, which goes live today at 1pm ET.